Ten miles of roads through mountain meadows, across hillsides, and over streams enable endless on-ranch summer (hiking, trail running, horseback riding, mountain biking, ATVing) and winter (cross-country skiing, snowshoeing, snowmobiling) recreational activities. As a forest service inholding, the ranch is a virtual private wilderness retreat, and the public lands surrounding it extend the ranch’s backyard far beyond the property’s borders. It is extremely rare to find a wild and beautiful forest service inholding of nearly 1,000 acres lying only 12 miles from a year-round recreational town and within an hour of a world famous resort community like Jackson Hole. Undoubtedly, this piece of wilderness could be one of the most desirable mountain retreats in the region. 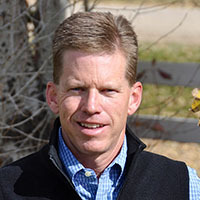 Trent came to Hall and Hall in the spring of 2003 after spending eight years with The Idaho Nature Conservancy where, as Lands Program Director, he was responsible for overseeing the chapter’s real estate activity around the state. Trent also served as the Conservancy’s field representative for central Idaho where he worked with local communities and landowners to preserve working ranchlands and resolve natural resource conflicts. He became a partner of Hall and Hall in March 2004 and is a licensed real estate broker in Idaho, Oregon and Montana. A native of Virginia, Trent graduated from Woodberry Forest School and earned his Bachelor of Arts degree in history from Hampden-Sydney College. Trent and his wife, Cecile, moved west to Idaho in 1994. Enjoyment of the outdoors is evident in Trent’s dedication to fly-fishing and upland bird hunting. Trent maintains strong ties to the southeast and is a trustee of The Duke Endowment based in Charlotte, NC and a committee member of the Josiah Charles Trent Memorial Foundation in Durham, NC. He currently serves on the Board of Directors of the Wood River Land Trust in Sun Valley and is past president. Trent and Cecile have two children, a son Parker and a daughter Airey. As a licensed real estate broker since 2003 and owner of a pure-bred Angus ranch since 1994, Ken is intimately acquainted with the complexity and rewards of balancing agriculture, land stewardship, and sound business practices in today’s West. A native of Utah, Ken spent many formative years working on his family’s ranch in Tetonia, Idaho, developing his lifelong passions for skiing, fly-fishing, and old-fashioned hard work. He earned a degree in engineering from Utah State University and an MBA from Pepperdine. After an early career in the aerospace industry, Ken returned to Teton Valley, Idaho, where he now manages the family Angus operation, works as a real estate broker, and plays as a husband, father and avid outdoorsman. 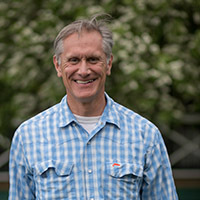 Active in his community, Ken has served on the boards of directors of the Community Foundations of Teton Valley and Jackson Hole, the Teton Regional Land Trust, and Teton Valley’s Family Safety Network. Teton Timbers Ranch is a one-of-a-kind, wild and beautiful 960± acre private inholding within the Big Hole Mountains of the 2.5 million acre Caribou-Targhee National Forest. It is located in the Teton Valley 12 miles west of Driggs, Idaho and its jet-capable general aviation airport. The property is almost completely surrounded by national forest and an easy drive to some of the best fly-fishing and skiing in the world. The terrain consists of elevated and forested hillsides punctuated by aspen groves, open parks, creeks, sweeping views of the Teton Range and inspiring views of the Grand Teton itself. Teton Timbers Ranch is a virtually untouched wilderness property perfect as a very private mountain biking, hiking, horseback riding, ATV’ing, cross-country skiing, snowshoeing and snowmobiling getaway. It has the unusual benefit of being only a short and mostly paved drive from downtown Driggs, Grand Targhee Ski Resort, and Huntsman Springs Golf Course, which together make up one of North America’s prominent year-round resort communities; overshadowed only by the area’s better known neighbor, Jackson Hole, located just 30 minutes further away on the “other side” of the Tetons. Teton Timbers Ranch is surrounded almost entirely by the 2.5±-million acre Caribou-Targhee National Forest, which itself, borders Grand Teton and Yellowstone National Parks. This extends the ranch’s backyard far beyond the property boundary, adding even more year-round recreational opportunities and bringing the ranch owners in contact with moose, elk, deer, raptors and all of the wildlife of the area. Only a single private landowner joins the ranch. Located along the southeast corner of Teton Timbers, this property consists of 120± acres held in a conservation easement with the Teton Regional Land Trust, limiting future development. Teton Timbers Ranch lies along the east face of the Big Hole Mountains and controls a series of spring-fed drainages that emerge from a rocky ridge that is the dominant feature of this mountain range. Accessed from the south end of Horseshoe Canyon from a paved county road, the ranch road leaves the county road at the historic townsite of Sam and follows a very good gravel road for 1.2 miles along an easement through national forest and dead ends at the ranch entry gate. The lower elevations of the ranch are shielded from the valley floor by a series of foothills referred to as Idaho Ridge and offer some of the best mountain bike riding in the region. The current owners have constructed a backcountry yurt just above the entry gate. This would also be an ideal spot for a new owner or a manager’s home as it sits on a dramatic landing that commands views of both the high ridges that form Packsaddle Basin west of the property and the more distant peaks of the Grand Teton Range to the east. The ranch can also be accessed from a series of entrance roads off Packsaddle Road (a Forest Service road that runs north from the entrance road paralleling the property along its eastern boundary). These access points allow one to enter the property along the series of drainages, which flow through the land from west to east. The terrain consists of hillsides marked by groves of conifers and aspens interspersed with grassy parks. There is a network of ten miles of roads that provide good access to all but the most remote portions of the property. The original homesite is served by power and telephone. Buried utility lines pass through the southern portion of the ranch to access a microwave facility beyond the property boundary. Several other homesites sit in beautiful meadows with creeks flowing by and amazing views of the Tetons to the east. There are about 12 million board feet of merchantable timber currently standing on the property. A plan currently in place to sustainably harvest some of these trees would not only provide a potential source of income for the next owner, but would also open up additional meadows and glades. Located in the Big Hole Mountains that form one side of Idaho’s Teton Valley, Teton Timbers Ranch lies 12 miles west of the mountain community of Driggs and 45 miles from Jackson Hole. Access to the ranch is over well-maintained, paved county roads until the final mile, which is along a very good gravel road over adjoining national forest lands to the ranch gate. Teton Timbers Ranch lies between 6,600 and 7,600 feet above sea level on generally east-facing, partially timbered, and gently sloping hillsides of the Big Hole range. The ranch sits at the head of six named tributaries to the North Fork of Horseshoe Creek, which is an important tributary to the Teton River. The property lies three miles north of Garns Mountain, which at 9,016± feet is the highest peak in the Big Hole range.Nearby Driggs and its sister community of Victor offer a wide variety of services and amenities including high-end restaurants, gourmet coffee shops, grocery and hardware stores, several golf courses and Grand Targhee Ski Resort (recently ranked as one of the nation’s top ten ski resorts by Forbes magazine). Additionally, Driggs has an excellent general aviation airport, the Driggs-Reed Memorial Airport, served by Teton Aviation Center, offering an on-site restaurant, pilot’s lounge, custom concierge services, maintenance, hangers and a paved 7,300 by 100 foot runway at 6,230± feet in elevation.A more extensive offering of services is found in either Jackson or Idaho Falls. The former needs no introduction and is known as the gateway to Teton National Park and the southern entrance to Yellowstone National Park. Jackson Hole is an easy 45-mile drive east from the ranch along scenic state highways. Jackson embodies the romantic cowboy heritage of years gone by and is one of the country’s most popular destinations for tourists and outdoor enthusiasts. Here you will find plentiful fine dining options, five-star hotels, museums and cultural offerings, rodeos and recreation options that rival anyplace in the West. Idaho Falls is 75 miles west of the ranch and offers a wide variety of commercial and retail establishments. Both communities provide good commercial air service to cities throughout the U.S. The Teton Valley is an expansive, fertile valley lying between the peaks of the Grand Tetons to the east, the Palisade Range to the south, and the more intimate Big Hole Mountains to the west. The valley is the headwaters of the Teton River, a blue ribbon trout fishery, and once a strategic center of the fur trade in the northern Rocky Mountains. The Teton Valley was once known as Pierre’s Hole in honor of “le grand Pierre” Tivanitagon, a mountain man and fur trapper who laid claim to the area’s trapping rights. Unlike the neighboring valley on the east side of the Tetons, known as Jackson’s Hole, the name Pierre’s Hole did not last after being settled by Mormon pioneers in the late 1800’s. As real estate values and the cost of living soared on the other side of the Tetons in Jackson Hole, many moved “over the hill” to Victor and Driggs, and many locals started referring to the valley as the “quiet side of the Tetons.” Much like Basalt and Carbondale are to Aspen, these once sleepy towns have become diverse, vibrant communities that attract seasonal visitors and year-round residents alike. Many have moved to Driggs and Victor to escape the huge influx of tourists who pass through Jackson each summer. Driggs also boasts a dynamic agricultural economy which adds to its diversity. Although located in Wyoming, Grand Targhee Resort can only be accessed via Driggs and is one of the valley’s greatest attractions. Widely recognized for its outstanding powder snow conditions, with over 500 inches of snowfall during many seasons, Grand Targhee has become a destination resort in its own right and is an easy drive from the ranch. Cross-country skiing, snowshoeing and snowmobiling are also very popular winter activities in Driggs and Jackson.Besides being the county seat, Driggs features a new golf development named Huntsman Springs. The Huntsman family, of Huntsman Chemical, invested substantially in the development and engaged the renowned golf architect, David McLay Kidd, to design the course at Huntsman Springs. McLay Kidd considers this to be his “greatest golf architectural achievement.” Rated amongst the top hundred in the world, the course has won many awards and is only minutes from the ranch.Teton Valley is well known for its summer recreation, particularly the outstanding fly fishing in the Teton River, South Fork of the Snake, and the famous Henry’s Fork. The Big Hole Mountains are a friendly range that attract local recreationists for hiking and mountain biking. The ranch dominates much of the eastern face of these mountains. In short, this part of the Teton Valley has come to combine agriculture and recreation in a very positive way. Lying between 6,600 and 7,600 feet above sea level in the eastern corner of the Snake River Plain, Teton Timbers Ranch experiences a full four seasons of weather. Total annual precipitation in the valley averages 17 inches, with over half of that coming from snow. The winters bring substantial snow accumulations, which are ideal for winter recreation such as cross-country skiing, snowshoeing and snowmobiling. Summertime temperatures average in the high 70’s and most summer days begin with a light jacket, as morning lows range in the mid-40’s. During the winter months, highs average in the upper 20’s and lows dip into the single digits. No permanent structures stand on the property. A single yurt mounted on a Trex decking platform, offering commanding views of the Grand Tetons and Teton Valley, is located above the ranch entrance. The yurt has electrical and gas service with well water to the site. The current yurt site, along with numerous open meadows, offer the new owner a virtual “blank canvas” on which to create a building compound. There are six named mountain streams that begin on the property, as well as a domestic well at the site of the yurt. A spring located on the property has an approved water right for domestic use and was once used as a domestic water source. There are no irrigation water rights. Seller will convey 100 percent of the mineral rights it owns. The current owners completed a sustainable timber harvest in 2015. The American Forest Foundation awarded its American Tree Farm System certification to the property. The certification means that the timber harvest was done in accordance with best practices for reforestation, aesthetics, and the protection of air, water, soil and wildlife. Further, the timber harvest also reduced the risk of wildfire, cut back on parasitic plants and bugs and increased species diversity. Douglas fir, lodgepole pine, Engelmann spruce and quaking aspen comprise the nearly 12 million board-feet of timber currently standing on the property. The current owners removed roughly three million board-feet in 2015. Another two million could be removed under the same prescription by the next owner. The costs of this harvest would be very low as the road infrastructure is already in place. Based upon past years, the real estate taxes are estimated to be $5,122 per year. Deer, elk, moose, mountain lion, and black bear are the primary big game species to be found on and around the ranch. Avian species include bald eagles, red tail hawks, goshawk, peregrine falcon, three-toed woodpeckers, great gray owls and ruffed grouse. The property is rich in smaller mammals and birds in season, as it is a lush, protected parcel surrounded by national forest with an abundance of springs and small creeks.Resident and non-resident deer and elk tags are available over the counter in Idaho and the Teton Timbers Ranch offers good on-site hunting and direct access to thousands of acres of public lands with game. All four seasons offer an amazing number of on-ranch activities. In the spring and summer, hike, ride horses, mountain bike, drive ATVs or just watch the wildlife wandering through the ranch. Explore the ranch during the winter months via snowshoes, cross-country skis or by snowmobile. These same activities, and more, can be had on forest service lands surrounding the ranch and in the greater Driggs/Jackson area. Among the Sawtooth Valley's historic treasures, the 360± acre Hot Springs Ranch features panoramic views, Salmon River frontage, a 2,000± sq. ft log cabin, and geothermal water rising on the ranch and developed for the owner's use. 45 miles north of Sun Valley. Located between Lewiston and Moscow, this diverse 720± acre property features timbered hillsides, cropland, meadows, springs, ponds, and Little Potlatch Creek. In the same family for over 60 years. Year-round operating ranch consisting of 2,375± deeded acres with Big Wood River frontage, over 500 acres of irrigation, a 1.5± acre trout pond, and a full set of residential ranch improvements. 640± undeveloped acres surrounded by BLM 20 miles from Sun Valley’s airport with excellent grazing resources, home sites, views, and potential for landowner tags. Year-round access to Hwy. 75.